Downtown, along with many other areas of Topeka, is experiencing a rebirth. That means you will find works of art which are old and new - with highlights including the five-block stretch of S Kansas Avenue in Downtown Topeka which is home to numerous pieces of public art installed in 2016, the statehouse and many other existing works of art. Statehouse artwork is listed separately and is found here. Located in the lobby of the Westar Energy building, this mural depicts the history of electricity in Kansas from the turn of the century to the present, focusing on the men and women whose hard work made it possible. Painted by the grandson of Thomas Hart Benton it is 8’ by 32’ and represents the Regionalist style of painting. Located in the First Presbyterian Church, these stained glass windows were installed in 1914 at a cost of $11,000. 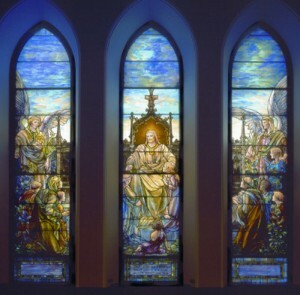 The windows, which portray biblical scenes, are now considered irreplaceable works of religious art. The windows can be viewed from inside the church Mon-Fri from 8:30a-4p. Located outside the west doors of the Topeka Performing Arts Center, this 8’ bronze statue of a female mariachi singer stands as a memorial to Mariachi Estrella de Topeka, one of the first all-female mariachis in the United States. Four of the group’s six members were killed in the 1981 Hyatt Regency Hotel skywalk disaster in Kansas City. This aluminum kinetic sculpture moves with the wind and is located in the pocket park designed by Architect One. The 9,000 pound stone bison was carved by Emporia artist Alan Tollakson.